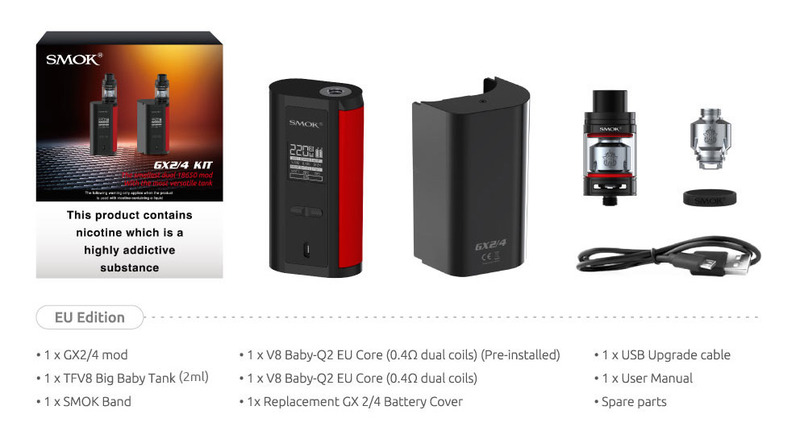 The SMOK GX2/4 features dual or quad 18650 battery configuration and maximum wattage of 350 watts with the quad battery and 220 watts with the dual battery configuration. The GX2/4 supports Nickel, Titanium and Stainless Steel 316 wire in both configurations. Smoktech GX 2/4 Kit also features large 0.96" OLED display screen, tactile hidden side fire button and requires an external battery charger.